We encourage all volunteers to stay as long as possible to maximize local and personal benefit. Minimum stay is 1 week. We encourage longer commitments by discounting each additional week stayed. Maximum stay is 1 month. We ask our volunteers to arrive and leave Nueva Gerona on a Sunday. 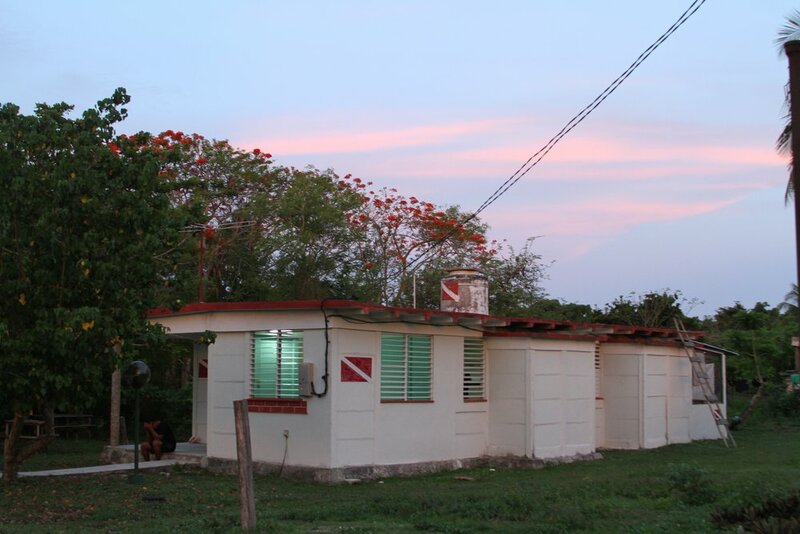 Accommodation is provided at Villa Arrecife, our volunteer house and dive center. The house has two bedrooms, a living room, kitchen, and back patio and is located only a short walk away from the ocean and town center. You will share the house only with other volunteers. A private chef comes daily to the house to cook all meals—for many volunteers this is the best food in all of Cuba! We provide volunteers with a Cuban cellphone and five hours of wifi (not high speed) each week. Please note that as Cocodrilo is located in the tropics, there are mosquitoes and bugs all year around. The season with the most mosquitoes and sand fleas is April through October. We provide volunteers with mosquito nets for the volunteer house and ask volunteers to bring their own repellent and lightweight clothing, but mosquitoes are very aggressive! If you are sensitive to bug bites, we recommend traveling outside of the summer months. The program fee is necessary to cover your cost of living and logistics. Discounts are available for partners and families. Our overhead is covered by other means, and thus, 100% of any funds that exceed your direct cost will go towards the project you participated in. To book you need to pay a refundable Reservation Deposit. The deposit is deducted from your total program fee. The program fee covers all your costs once on the Isle of Youth, including room and board, local coordination, transportation from Nueva Gerona to Cocodrilo (and all transportation once in Cocodrilo), full access to facilities, volunteering activities (including snorkeling and one hour of scuba diving each day), five hours of wifi weekly, and 24-hour support on site. You are responsible for your international airfare to Cuba, airfare from Havana to Nueva Gerona, visa, and any personal expenses. You will be responsible for any scuba diving you do above the one daily dive included in your program fee. Each dive costs 25 CUC and you are allowed to do one additional dive each day. Cocodrilo is a remote coastal community of 330 residents located on the Southwest coast of Cuba’s Isla de la Juventud in the Protected Area of Managed Resources “Sur de la Isla.” Cocodrilo neighbors Punta Frances National Marine Park, and was founded in 1904 by fishermen from the Cayman Islands. Cocodrilo has undergone many socioeconomic changes in recent years, largely as a result of the closure of the sea turtle fishery in 2008. For many years, the commercial fishing of finfish has been the main source of economic prosperity for the community. As overfishing has increased, however, community members have begun to consider sustainable tourism that supports local marine conservation as an alternative. In support of this, IOI volunteers in Cocodrilo will participate in marine conservation initiatives, such as coral reef restoration, and sea turtle monitoring. The volunteer house--2 minutes walking to the ocean! As a volunteer, you will stay in the volunteer house known as Villa Arrecife, located half a block from the ocean. The house has two bedrooms and one bathroom. Volunteers will have a private room as long as availability permits, and will share a bathroom. There is running water and electricity in the house. There is no air conditioning, but a fan and the sea breeze will keep you cool and refreshed. Laundry will be done for you, up to two times per week. Sheets and towels are provided, and they will be changed weekly. Three meals a day will be prepared for you (breakfast, lunch, dinner), at the house. The food is typical Cuban cuisine, and the chef can adapt to your dietary restrictions. WiFi is located in a public park down the street from the volunteer house. Please keep in mind there are mosquitoes and bugs all year around and the high season for mosquitoes is during summer months (April through October). Volunteering in Cocodrilo is a uniquely immersive and meaningful experience you’ll carry with you from the moment you step foot on the Isla de la Juventud!